Setting up sound systems can be a daunting task for those who are unfamiliar with audio equipment. Even connecting home stereos can be troublesome for beginners. In this article, we’ll outline some of the basics of sound equipment without getting overly complex so that you have a better understanding of the purpose of each component in your public address system. Before you know it, you’ll be a pro at setting up your sound system and troubleshooting some common problems. 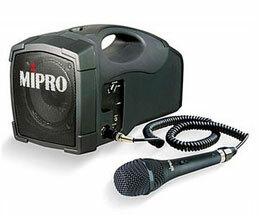 The microphone is the first component of most any public address, or PA, system. Technically speaking it is a "transducer", which is just a fancy name for something that takes one type of energy and converts it to another. In the case of a microphone, acoustic energy (sound pressure) is converted to electrical energy (a voltage). Microphones are designed to accomplish this transduction in a number of ways, but most use either electromagnetism or a large capacitor. Although there are tons of different kinds of microphones on the market, the most common design is called a dynamic microphone which uses electromagnetism. 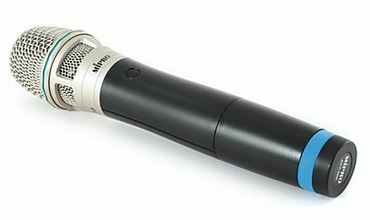 The two most popular dynamic microphones used for live sound include the handheld microphone and the lapel microphone. 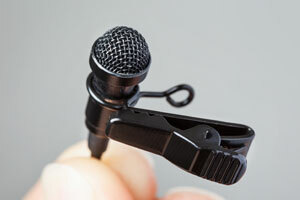 Handheld microphones are just that--held in the speaker's hand or placed in a specially designed clip. Lapel, or lavalier, microphones are also pretty self-explanatory, as they clip right onto the lapel of the speaker's clothing. Now that you are familiar with some of the technical aspects of microphones, let's take a look at how they are used. Since a microphone converts sound pressure to a voltage for the purpose of amplification, it is commonly placed in line with a speaker's mouth or in front of a loudspeaker of a different sound source/system; see avoiding microphone feedback in the next section) to reamplify music. For the best results, the microphone should be placed at a reasonable distance from the sound source so that it is neither too close nor too far away. Try placing your microphone at a couple different distances to get a feel for it. As a general rule, set the microphone up so that the source sounds most natural. SCREEEECCCCHHH! Ever been at a high school talent show or public speaking event and heard that awful sound? That's called feedback, and it's easier to avoid than people think! 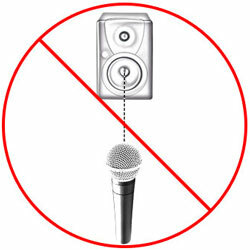 Never place a microphone directly in line with the loudspeakers of the same system. This will create a feedback loop where the sound source is amplified over and over resulting in that awful sound we all know too well. To avoid feedback, keep your loudspeakers closer to the audience than the microphone. If you have done this but are still experiencing feedback, simply turn down the input level of the microphone and ensure the loudspeakers are not directed at overly reflective surfaces. For more information, check out our detailed guide for properly setting up your microphone and loudspeakers. 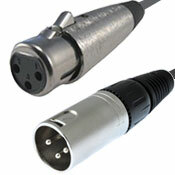 Most microphones use XLR, or 3-pin, connector cables but some use 1/4" TRS jacks. A few even connect with smaller 1/8" headphone-style jacks. In any case, the cable connects to the microphone on one end and the input of the mixer on the other. 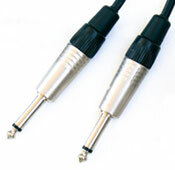 The same or similar cables are also used when connecting the mixer, power amp, and loudspeakers together. While most microphones feature a wired design (meaning they are connected directly to the sound system with a cable), some are wireless. Wireless receivers are ideal for interactive presentations where the presenter moves around a lot or takes questions from audience members. There are two things to keep in mind when using a wireless system: battery power and frequency. Because the microphones are wireless, they require some type of disposable or rechargeable battery. In a wireless system, the sound signal is transmitted over a specific frequency much like a cordless telephone. If you are using more than one wireless system, be sure that they are set to different frequencies. Otherwise the signals may cross over causing one or both signals to drop out entirely. Mixers allow multiple sound sources to be blended together so they can be played out of the same loudspeakers. 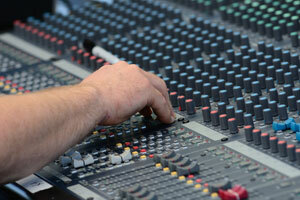 Mixers range from single input designs to very large elaborate mixing consoles and desks with hundreds of inputs. Sound sources such as MP3 players and laptops can be plugged directly into the inputs without a microphone when background music or supplemental audio is needed. Just be sure to adjust the output level of your music playing device accordingly to avoid overloading the system. The amplifier is the next part of the chain. Amplifiers, or amps, electronically increase the level of the initial sound source. Sometimes mixers come with built-in amps, which simplifies the setup process for the user. If the amp is not built-in, separate cables are needed to transmit the signal from the mixer to the amplifier. All-in-one designs are called "powered mixers". Most of the models we sell are designed as all-in-one, or boxed, units so that setup is easier for the user. In some cases, the loudspeakers include built-in amplifiers rather than the mixer, but most loudspeakers are "unpowered", or "passive" and must be connected to a separate amplifier to generate sound. Loudspeakers are the final piece of the public address system and reproduce the amplified sound. Think of the loudspeaker as the opposite of a microphone. Although they are both transducers, the loudspeaker converts an electrical signal, or voltage, back to acoustic energy. Most importantly, the reproduced sound is much louder than the original source. Loudspeakers utilize a variety of different cables depending on the manufacturer, but most work with the aforementioned TRS and XLR connections. Check your specific model for details on how to connect it. 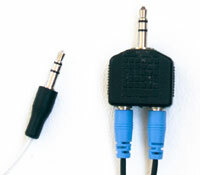 In rare cases, special adapters are needed to run the signal from the amplifier to the loudspeakers. Most of our PA systems come with all the necessary components and cables for simple setup but you may encounter other situations when dealing with other manufacturers’ equipment. Loudspeakers are available in a variety of different sizes and wattages. It is very important that users select the right wattage and impedance when connecting them but again most all-in-one PA systems (including the models we carry) feature loudspeakers that are perfectly matched. If you are unsure about the compatibility of your components, read the included manual or contact the manufacturer directly for details. If you are considering a PA system purchase, figure out how advanced your knowledge of sound systems is first. If you are a beginner, purchasing an all-in-one system is ideal. This way, you won’t need a technical background to get set up. If you are a little more advanced, then you can consider putting your own PA system together. Just be sure to match impedance, wattage, and connectors accordingly.